Nickelodeon USA has announced the exciting news that they'll be premiering the action-packed third seasons of the viral sports clip series Crashletes and comedy-sport series The Dude Perfect Show in February 2019! With even more outrageous sports moments and a superstar lineup of guest commentators, the new season of Crashletes will premiere on Nick on Sunday, Feb. 3, at 12:45 p.m. (ET/PT), following the brand-new Double Dare at Super Bowl special at 12:00 p.m. (ET/PT)! In the premiere episode, Los Angeles Rams star running back Todd Gurley tests out the show’s new app, “Instaslam,” and checks out very costly crashes in the brand-new viral clip category, “High-Priced Crashletes.” Click here for a sneak-peek on ThePostGame.com! Throughout the season, co-hosts Brandon Broady and Stevie Nelson will be joined by a guest athlete in each episode who will help provide in-depth analysis of viral sports bloopers, blunders and absurdities. Fan-favorite viral clip categories returning this season include: “Synchronized Stinking,” a celebration of our favorite pairs of Crashletes who fail together; “Friday Night Cat Fights,” when cats show off their fighting skills; and more. Brand-new categories include: “Ball of the Wild,” when animals take athleticism to new heights, and “Crashletes Cucumbers,” where athletes remain incredibly cool under the pressure of a fail. Celebrity athletes making appearances throughout the season are: Ryan Blaney (NASCAR), Dustin Brown (Los Angeles Kings), Brandi Chastain (former USA Soccer player), Skylar Diggins-Smith (Dallas Wings-WNBA, Little Ballers), Prince Fielder (former MLB player), Jessie Graff (professional stunt woman), Tony Hawk (professional skateboarder), Laurie Hernandez (Olympic gold medal gymnast), Melvin Ingram (Los Angeles Chargers), DeAndre Jordan (Dallas Mavericks), Gus Kenworthy (Olympic silver medalist skier), Becky Lynch (WWE), The Miz (WWE), Candace Parker (Los Angeles Sparks-WNBA), Ryan Sheckler (professional skateboarder), Bubba Wallace (NASCAR), DeMarcus Ware (former NFL player) and Shaun White (professional snowboarder). 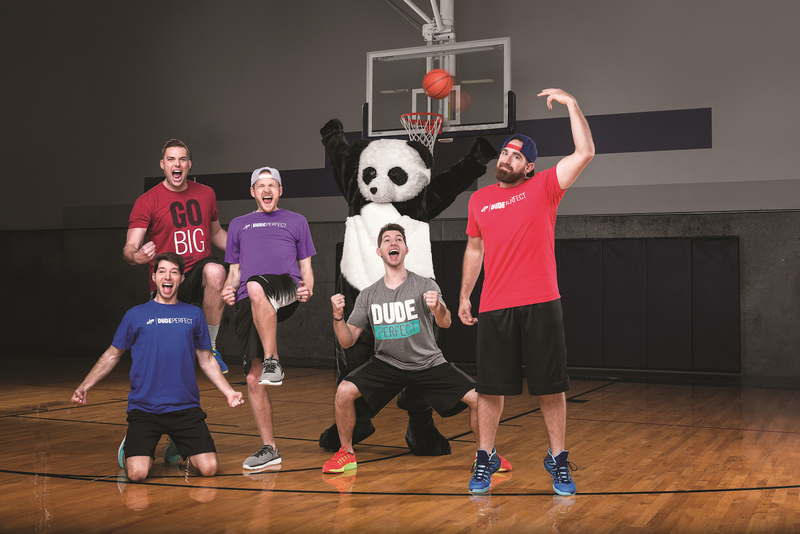 Featuring unbelievable stunts and adrenaline-inducing challenges, The Dude Perfect Show will premiere on Friday, Feb. 8, at 7:30 p.m. (ET/PT)! In the premiere episode, the Dudes take rocket technology, and themselves, to new heights as they challenge each other to develop alternate uses for rockets, and later create their own “Sport of the Future” that is played in the air. The new season will showcase the guys’ “Go Big” mantra in their unique world of sports stunts, crazy competitions and the all-out hilarious friendship between best friends Tyler Toney, Cody Jones, Garrett Hilbert, twins Coby and Cory Cotton, and their beloved panda mascot. Episodes will take a behind-the-scenes look as the Dudes dream up their next viral video, prep wacky battles and create hilarity in their headquarters in Dallas, Texas. This season, viewers will see the Dudes continue to push themselves even harder as they attempt a challenging trick shot using a giant RC plane, build the ultimate State Fair game experience, take on some requests from their fans, create an action movie trailer, and attempt one of their most incredible stunts ever, a Bungee Jump Dunk! Special guests Daniella Perkins and Owen Joyner from Nickelodeon's hit comedy Knight Squad also join the Dudes for an episode to challenge them to create the ultimate trick shot Escape Room! Crashletes and The Dude Perfect Show will continue to air regularly back to back in an hour-long sports programming block on Fridays at 7 p.m. (ET/PT) on Nickelodeon. Both shows are created by Rob Dyrdek and Shane Nickerson of Superjacket Productions (Ridiculousness, Fantasy Factory). More Nick: Nickelodeon USA's February 2019 Premiere Highlights! Originally published: Friday, January 25, 2019. Follow NickALive! on Twitter, Tumblr, Reddit, Google+, via RSS, on Instagram, and/or Facebook for the latest Nickelodeon, Crashletes and The Dude Perfect Show News and Highlights!